Payments MUST be made ONLINE by January 30th. 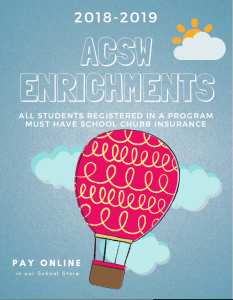 All students enrolled in an enrichment program MUST have school CHUBB Insurance. Please be advised, pick-up for ALL enrichment programs, except those hosted by Coach Williams, will be through the walkers (east) door. Please visit our online school store to see all the programs we have to offer!